For other uses, see European Championship in football. The UEFA European Championship (known informally as the Euros) is the primary association football competition contested by the senior men's national teams of the members of the Union of European Football Associations (UEFA), determining the continental champion of Europe. Held every four years since 1960, in the even-numbered year between World Cup tournaments, it was originally called the UEFA European Nations' Cup, changing to the current name in 1968. Starting with the 1996 tournament, specific championships are often referred to in the form "UEFA Euro [year]"; this format has since been retroactively applied to earlier tournaments. Prior to entering the tournament all teams other than the host nations (which qualify automatically) compete in a qualifying process. The championship winners earn the opportunity to compete in the following FIFA Confederations Cup, but are not obliged to do so. The 15 European Championship tournaments have been won by ten national teams: Germany and Spain each have won three titles, France has two titles, and Soviet Union, Italy, Czechoslovakia, Netherlands, Denmark, Greece and Portugal have won one title each. To date, Spain is the only team in history to have won consecutive titles, doing so in 2008 and 2012. It is the second most watched football tournament in the world after the FIFA World Cup. The Euro 2012 final was watched by a global audience of around 300 million. The most recent championship, hosted by France in 2016, was won by Portugal, who beat France 1–0 in the final at the Stade de France in Saint-Denis after extra time. The final also attracted 284 million viewers which is the second most viewed game in European tournament history. The idea for a pan-European football tournament was first proposed by the French Football Federation's secretary-general Henri Delaunay in 1927, but it was not until 1958 that the tournament was started, three years after Delaunay's death. In honour of Delaunay, the trophy awarded to the champions is named after him. The 1960 tournament, held in France, had four teams competing in the finals out of 17 that entered the competition. It was won by the Soviet Union, beating Yugoslavia 2–1 in a tense final in Paris. Spain withdrew from its quarter-final match against the USSR because of two political protests. Of the 17 teams that entered the qualifying tournament, notable absentees were England, the Netherlands, West Germany and Italy. Spain held the next tournament in 1964, which saw an increase in entries to the qualification tournament, with 29 entering; West Germany was a notable absentee once again and Greece withdrew after being drawn against Albania, with whom they were still at war. The hosts beat the title holders, the Soviet Union, 2–1 at the Santiago Bernabéu Stadium in Madrid. The tournament format stayed the same for the 1968 tournament, hosted and won by Italy. For the first and only time a match was decided on a coin toss (the semi-final Italy vs. Soviet Union) and the final went to a replay, after the match against Yugoslavia finished 1–1. Italy won the replay 2–0. More teams entered this tournament (31), a testament to its burgeoning popularity. Belgium hosted the 1972 tournament, which West Germany won, beating the USSR 3–0 in the final, with goals coming from Gerd Müller (twice) and Herbert Wimmer at the Heysel Stadium in Brussels. This tournament would provide a taste of things to come, as the German side contained many of the key members of the 1974 FIFA World Cup Champions. The 1976 tournament in Yugoslavia was the last in which only four teams took part in the final tournament, and the last in which the hosts had to qualify. Czechoslovakia beat West Germany in the newly introduced penalty shootout. After seven successful conversions, Uli Hoeneß missed, leaving Czechoslovakian Antonín Panenka with the opportunity to score and win the tournament. An "audacious" chipped shot, described by UEFA as "perhaps the most famous spot kick of all time" secured the victory as Czechoslovakia won 5–3 on penalties. The competition was expanded to eight teams in the 1980 tournament, again hosted by Italy. It involved a group stage, with the winners of the groups going on to contest the final, and the runners-up playing in the third place play-off. West Germany won their second European title by beating Belgium 2–1, with two goals scored by Horst Hrubesch at the Stadio Olimpico in Rome. Horst Hrubesch scored early in the first half before René Vandereycken equalised for Belgium with a penalty in the second half. With two minutes remaining, Hrubesch headed the winner for West Germany from a Karl-Heinz Rummenigge corner. France won their first major title at home in the 1984 tournament, with their captain Michel Platini scoring 9 goals in just 5 games, including the opening goal in the final, in which they beat Spain 2–0. The format also changed, with the top two teams in each group going through to a semi-final stage, instead of the winners of each group going straight into the final. The third place play-off was also abolished. West Germany hosted UEFA Euro 1988, but lost 2–1 to the Netherlands, their traditional rivals, in the semi-finals, which sparked vigorous celebrations in the Netherlands. The Netherlands went on to win the tournament in a rematch of their first game of the group stage, beating the USSR 2–0 at the Olympia Stadion in Munich, a match in which Marco van Basten scored one of the most memorable goals in football history, a spectacular volley over the keeper from the right wing. UEFA Euro 1992 was held in Sweden, and was won by Denmark, who were only in the finals because UEFA did not allow Yugoslavia to participate as some of the states constituting the Socialist Federal Republic of Yugoslavia were at war with each other. The Danes beat holders the Netherlands on penalties in the semi-finals, then defeated world champion Germany 2–0. This was the first tournament in which a unified Germany took part and also the first major tournament to have the players' names printed on their backs. England hosted UEFA Euro 1996, the first tournament to use the nomenclature "Euro [year]" and would see the number of teams taking part double to 16. The hosts, in a replay of the 1990 FIFA World Cup semi-final, were knocked out on penalties by Germany, who would go on to win in the Final 2–1 against the newly formed Czech Republic thanks to the first golden goal ever in a major tournament, scored by Oliver Bierhoff. This was Germany's first title as a unified nation. UEFA Euro 2000 was the first tournament to be held by two countries, in the Netherlands and Belgium. 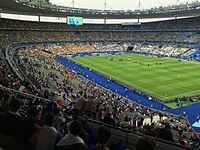 France, the reigning World Cup champions, were favoured to win, and they lived up to expectations when they beat Italy 2–1 after extra time, having come from being 1–0 down: Sylvain Wiltord equalised in the very last minute of the game and David Trezeguet scored the winner in extra time. UEFA Euro 2004, like 1992, produced an upset: Greece, who had only qualified for one World Cup (1994) and one European Championship (1980) before, beat hosts Portugal 1–0 in the final (after having also beaten them in the opening game) with a goal scored by Angelos Charisteas in the 57th minute to win a tournament that they had been given odds of 150–1 to win before it began (being the second least likely team to have any success after Latvia). On their way to the Final, they also beat holders France as well as the Czech Republic with a silver goal, a rule which replaced the previous golden goal in 2003, before being abolished itself shortly after this tournament. The 2008 tournament, hosted by Austria and Switzerland, marked the second time that two nations co-hosted and the first edition where the new trophy was awarded. It commenced on 7 June and finished on 29 June. The Final between Germany and Spain was held at the Ernst Happel Stadion in Vienna. Spain defeated Germany 1–0, with a goal scored by Fernando Torres in the 33rd minute, sparking much celebration across the country. This was their first title since the 1964 tournament. Spain were the highest scoring team with 12 goals scored and David Villa finished as the top scorer with four goals. Xavi was awarded the player of the tournament, and nine Spanish players were picked for the team of the tournament. The UEFA Euro 2012 tournament was co-hosted by Poland and Ukraine. Spain defeated Italy 4–0 in the final, thus becoming the first nation to defend a European Championship title and the first nation to win three major international tournaments in succession (Euro 2008, 2010 World Cup, Euro 2012). In scoring the third goal of the Final, Fernando Torres became the first player to score in two European Championship finals. He was equal top scorer for the tournament with three goals in total, along with Mario Balotelli, Alan Dzagoev, Mario Gómez, Mario Mandžukić, and Cristiano Ronaldo, despite only being used as a substitute player. The tournament was otherwise notable for having the most headed goals in a Euro tournament (26 out of 76 goals in total); a disallowed goal in the England versus Ukraine group game which replays showed had crossed the goal line, and which prompted President of FIFA Sepp Blatter to tweet, "GLT (Goal-line technology) is no longer an alternative but a necessity", thus reversing his long-held reluctance to embrace such technology; and some crowd violence in group games. In 2007, the Football Association of Ireland and Scottish Football Association proposed the expansion of the tournament, which was later confirmed by the UEFA Executive Committee in September 2008. Out of the 54 member associations of UEFA, only three including England and Germany opposed the expansion. On 28 May 2010, UEFA announced that Euro 2016 would be hosted by France. France beat bids of Turkey (7–6 in voting in second voting round) and Italy, which had the fewest votes in the first voting round. UEFA Euro 2016 was the first to have 24 teams in the finals. This was the third time France have hosted the competition. Portugal, which qualified for the knock-out phase despite finishing third in its group, went on to win the championship by defeating heavily favoured host team France 1–0 in the final, thanks to a goal from Eder in the 109th minute. Cristiano Ronaldo, Portugal's world renowned striker, came out of the game due to injury in the 25th minute. This was the first time Portugal won a major tournament. For the 2020 tournament, three bids were proposed, including a bid from Turkey, a joint bid from the Republic of Ireland, Scotland and Wales, and a joint bid from Georgia and Azerbaijan. In December 2012, however, UEFA announced that the 2020 tournament would be hosted in several cities in various countries across Europe. The venues were selected and announced by UEFA on 19 September 2014. However, Brussels was removed as a host city on 7 December 2017 due to delays with the building of the Eurostadium. The Henri Delaunay Trophy, which is awarded to the winner of the European Championship, is named in honour of Henri Delaunay, the first General Secretary of UEFA, who came up with the idea of a European championship but died five years prior to the first tournament in 1960. His son, Pierre, was in charge of creating the trophy. Since the first tournament it has been awarded to the winning team for them to keep for four years, until the next tournament. For the 2008 tournament, the Henri Delaunay Trophy was remodelled to make it larger, as the old trophy was overshadowed by UEFA's other trophies such as the new European Champion Clubs' Cup. The new trophy, which is made of sterling silver, now weighs 8 kilograms (18 lb) and is 60 centimetres (24 in) tall, being seven inches longer and one pound heavier than the old one. The marble plinth that was serving as base was removed. The new silver base of the trophy had to be enlarged to make it stable. The names of the winning countries that had appeared on the plinth are now engraved on the back of the trophy. The players and coaches of the winning team and the runner-up team are awarded gold and silver medals, respectively. Each association that competes in the final tournament receives a commemorative plaque. Each losing semi-finalist as well as each finalist receive a dedicated plaque. Though there is no longer a third place play-off, UEFA decided in the 2008 edition to award the semi-final losers (Turkey and Russia) bronze medals for the first time, and did the same in the 2012 edition when Germany and Portugal received bronze medals. However, UEFA decided that losing semi-finalists would no longer receive medals from the 2016 edition onwards. Bronze medals were previously awarded for winners of the third place play-off, the last of which was held in 1980. Before 1980, only four teams qualified for the final tournament. From 1980, eight teams competed. In 1996 the tournament expanded to 16 teams, since it was easier for European nations to qualify for the World Cup than their own continental championship; 14 of the 24 teams at the 1982, 1986 and 1990 World Cups had been European, whereas the European Championship finals still involved only eight teams. For 2016, the competition has increased to 24 teams. 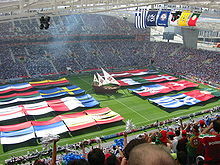 In 2007, there was much discussion about an expansion of the tournament to 24 teams, started by Scotland and the Republic of Ireland, due to the increased number of football associations in Europe after the break-ups of Czechoslovakia, Yugoslavia and the Soviet Union, and the inclusion of Israel and Kazakhstan. The new president of UEFA, Michel Platini, was reported to be in favour of expansion which proved an accurate assumption. Whilst on 17 April 2007, UEFA's Executive Committee formally decided against expansion in 2012, Platini indicated in June 2008 that UEFA will increase participation from 16 to 24 teams in future tournaments, starting from 2016. On 25 September, it was announced by Franz Beckenbauer that an agreement had been reached, and the expansion to 24 teams would be officially announced the next day. The competing teams are chosen by a series of qualifying games: in 1960 and 1964 through home and away play-offs; from 1968 through a combination of both qualifying groups and play-off games. The host country was selected from the four finalists after they were determined through qualifying. Since the expansion of the final tournament starting from 1980, the host country, or countries, have been chosen beforehand and qualify automatically. To qualify, a team must finish in one of the qualifying spots or win a play-off. After this, a team proceeds to the finals round in the host country, although hosts qualify for the tournament automatically. The qualifying phase begins in the autumn after the preceding FIFA World Cup, almost two years before the finals. Coefficient from the matches played in its most recent qualifying competition. Average number of goals scored. Average number of away goals scored. The qualifying phase is played in a group format, the composition of the groups is determined through means of a draw of teams from pre-defined seeded bowls. The draw takes place after the preceding World Cup's qualifying competition. For UEFA Euro 2012, the group qualifying phase consists of nine groups; six of six teams and the remainder of five teams each. Higher number of points obtained in the group matches played among the teams in question. Superior goal difference from the group matches played among the teams in question. Higher number of goals scored in the group matches played among the teams in question. Higher number of goals scored away from home in the group matches played among the teams in question. Sixteen teams progressed to the final tournament for the 2012 tournament. They were joint hosts Poland and Ukraine, the winners and the highest ranked second placed team from the nine qualifying groups as well as the winners of four play-off matches between the runners-up of the other groups. These sixteen teams were divided equally into four groups, A, B, C and D, each consisting of four teams. The groups were drawn up by the UEFA administration, again using seeding. The seeded teams being the host nations, the reigning champions, subject to qualification, and those with the best points per game coefficients over the qualifying phase of the tournament and the previous World Cup qualifying. Other finalists were assigned to by means of a draw, using coefficients as a basis. For the 2016 tournament, the expansion to 24 teams means that the teams will be drawn into six groups of four, with the six group winners, six group runners-up and the four best third-placed teams advancing to the round of 16 when it becomes a knockout competition. The groups are again played in a league format, where a team plays its opponents once each. The same points system is used (three points for a win, one point for a draw, no points for a defeat). A schedule for the group matches will be drawn up, but the last two matches in a group must kick off simultaneously. The winner and runner-up of each group progresses to the next round, where a knockout system is used (the two teams play each other once, the winner progresses), this is used in all subsequent rounds as well. The winners of the quarter-finals matches progress to the semi-finals, where the winners play in the final. If in any of the knockout rounds, the scores are still equal after normal playing time, extra time and penalties are employed to separate the two teams. Unlike the FIFA World Cup, this tournament no longer has a third place playoff. ^ No third place play-off has been played since 1980; losing semi-finalists are listed in alphabetical order. ^ "2005/2006 season: final worldwide matchday to be 14 May 2006". FIFA.com. Fédération Internationale de Football Association. 19 December 2004. Retrieved 13 January 2012. ^ Roxborough, Scott (24 June 2015). "Amid FIFA Scandal, EBU Buys Euro 2016 Rights". The Hollywood Report. Retrieved 13 June 2016. ^ "Euro 2016 seen by 2 billion on TV; 600M tune in for final". ^ "UEFA European Football Championship origins". UEFA.com. Union of European Football Associations. 21 December 2011. Retrieved 24 February 2012. ^ "Delaunay's dream realised in France". UEFA.com. Union of European Football Associations. 30 January 2012. Retrieved 24 February 2012. ^ "The Henri Delaunay Cup". UEFA.com. Union of European Football Associations. 28 January 2012. Retrieved 24 February 2012. ^ "1960 UEFA European Championship – Teams". UEFA.com. Union of European Football Associations. Retrieved 24 February 2012. ^ "Ponedelnik heads Soviet Union to glory". UEFA.com. Union of European Football Associations. 1 October 2003. Retrieved 26 February 2012. ^ Rostance, Tom (21 May 2012). "Euro 1960: Lev Yashin leads Soviets to glory in France". BBC Sport. British Broadcasting Corporation. Retrieved 11 June 2012. ^ "France 1960". BBC Sport. British Broadcasting Corporation. 17 May 2004. Retrieved 24 February 2012. ^ "Spain savour home comforts". UEFA.com. Union of European Football Associations. 21 December 2011. Retrieved 24 February 2012. ^ "Spain 1964". BBC Sport. British Broadcasting Corporation. 17 May 2004. Retrieved 24 February 2012. ^ "Spain's Marcelino stoops to conquer Europe". UEFA.com. Union of European Football Associations. 2 October 2003. Retrieved 26 February 2012. ^ "Italy make most of good fortune". UEFA.com. Union of European Football Associations. 20 December 2011. Retrieved 24 February 2012. ^ "Italy 1968". BBC Sport. British Broadcasting Corporation. 17 May 2004. Retrieved 24 February 2012. ^ "Italy through to final after coin toss". UEFA.com. Union of European Football Associations. 2 October 2003. Retrieved 26 February 2012. ^ "Italy earn final replay against Yugoslavia". UEFA.com. Union of European Football Associations. 2 October 2003. Retrieved 26 February 2012. ^ "Riva return sparks Italy triumph". UEFA.com. Union of European Football Associations. 2 October 2003. Retrieved 26 February 2012. ^ "1968 UEFA European Championship – Teams". UEFA.com. Union of European Football Associations. Retrieved 24 February 2012. ^ "Müller the menace in German masterclass". UEFA.com. Union of European Football Associations. 3 October 2003. Retrieved 26 February 2012. ^ "West Germany make their mark". UEFA.com. Union of European Football Associations. 20 December 2011. Retrieved 24 February 2012. ^ "Belgium 1972". BBC Sport. British Broadcasting Corporation. 17 May 2004. Retrieved 24 February 2012. ^ Dunbar, Graham (2 July 2010). "Abreu's 'Panenka' penalty revives 1976 classic". USA Today. Associated Press. Retrieved 9 June 2012. ^ "Panenka the hero for Czechoslovakia". UEFA.com. Union of European Football Associations. 27 February 2008. Retrieved 9 June 2012. ^ "Italy 1980". BBC Sport. British Broadcasting Corporation. 17 May 2004. Retrieved 24 February 2012. ^ "Hrubesch turns West Germany's unlikely hero". UEFA.com. Union of European Football Associations. 4 October 2003. Retrieved 26 February 2012. ^ "Hrubesch crowns West German win". UEFA.com. Union of European Football Associations. 21 June 2008. Retrieved 9 June 2012. ^ "Platini shines for flamboyant France". UEFA.com. Union of European Football Associations. 20 December 2011. Retrieved 24 February 2012. ^ "Platini reflects on France's first success in 1984". UEFA.com. Union of European Football Associations. 20 December 2011. Retrieved 24 February 2012. ^ "France 1984". BBC Sport. British Broadcasting Corporation. 17 May 2004. Retrieved 11 June 2012. ^ "Van Basten sparks Netherlands joy". UEFA.com. Union of European Football Associations. 20 December 2011. Retrieved 24 February 2012. ^ "West Germany 1988". BBC Sport. British Broadcasting Corporation. 17 May 2004. Retrieved 24 February 2012. ^ "Van Basten ends Dutch wait". UEFA.com. Union of European Football Associations. 5 October 2003. Retrieved 26 February 2012. ^ "Van Basten remembers 'fantastic' EURO '88". UEFA.com. Union of European Football Associations. 20 December 2011. Retrieved 24 February 2012. ^ "Denmark late show steals spotlight". UEFA.com. Union of European Football Associations. 30 January 2012. Retrieved 25 February 2012. ^ "Sweden 1992". BBC Sport. British Broadcasting Corporation. 27 May 2004. Retrieved 25 February 2012. ^ "Schmeichel helps Denmark down Netherlands". UEFA.com. Union of European Football Associations. 5 October 2003. Retrieved 26 February 2012. ^ "Gatecrashing Denmark down Germany". UEFA.com. Union of European Football Associations. 5 October 2003. Retrieved 26 February 2012. ^ "Football comes home for Germany". UEFA.com. Union of European Football Associations. 1 February 2012. Retrieved 25 February 2012. ^ "Hosts denied by Germany in epic semi-final". UEFA.com. Union of European Football Associations. 6 October 2003. Retrieved 26 February 2012. ^ "Bierhoff hero of Germany's EURO '96 win". UEFA.com. Union of European Football Associations. 6 October 2003. Retrieved 26 February 2012. ^ "England 1996". BBC Sport. British Broadcasting Corporation. 17 May 2004. Retrieved 25 February 2012. ^ Lister, Graham (1 December 2011). "Euro 2012 History: The 2000 finals". Goal.com. Retrieved 11 June 2012. ^ "Golden boy Trezeguet relives France's 2000 glory". UEFA.com. Union of European Football Associations. 20 December 2011. Retrieved 25 February 2012. ^ McNulty, Phil (20 December 2004). "Greece defy the odds at Euro 2004". BBC Sport. British Broadcasting Corporation. Retrieved 25 February 2012. ^ "France 0–1 Greece". BBC Sport. British Broadcasting Corporation. 25 June 2004. Retrieved 25 February 2012. ^ "Greece 1–0 Czech Rep". BBC Sport. British Broadcasting Corporation. 1 July 2004. Retrieved 25 February 2012. ^ "Dellas delight stuns Czech Republic". UEFA.com. Union of European Football Associations. 2 July 2004. Retrieved 25 February 2012. ^ "Limit on international substitutions". UEFA.com. Union of European Football Associations. 28 February 2004. Retrieved 25 February 2012. ^ "All New Supersized Trophy for Euro 2008". worldcupblog.org. 2 May 2008. Retrieved 25 February 2012. ^ "UEFA EURO 2008 – Match Schedule" (PDF). UEFA.com. Union of European Football Associations. Retrieved 25 February 2012. ^ "Euro 2008 venues". BBC Sport. British Broadcasting Corporation. 27 May 2008. Retrieved 25 February 2012. ^ McNulty, Phil (29 June 2008). "Germany 0–1 Spain". BBC Sport. British Broadcasting Corporation. Retrieved 25 February 2012. ^ "EURO joy for Poland and Ukraine". UEFA.com. Union of European Football Associations. 19 April 2007. Retrieved 10 January 2012. ^ 4 – 0 FT. "Spain v Italy live football scores | Soccer scores and live video". ESPNFC.com. Archived from the original on 15 January 2013. Retrieved 2 July 2012. ^ "Sepp Blatter confident of positive goal-line technology vote". BBC Sport. British Broadcasting Corporation. 21 June 2012. Retrieved 2 July 2012. ^ "Uefa to expand Euro Championship". BBC Sport. British Broadcasting Corporation. 26 September 2008. Retrieved 6 December 2017. ^ "EURO expands to 24". UEFA.com. Union of European Football Associations. 26 September 2008. Retrieved 23 February 2014. ^ "Michel Platini annoyed at England after they opposed expansion of Euro 2016". The Guardian. 22 February 2014. Retrieved 23 February 2014. ^ "France beat Turkey and Italy to stage Euro 2016". BBC Sport. British Broadcasting Corporation. 28 May 2010. Retrieved 11 January 2012. ^ "UEFA approves 24-team Euro from 2016". UEFA.com. Union of European Football Associations. 27 September 2008. Retrieved 22 June 2012. ^ "TFF Başkanı'ndan Açıklama" [TFF President Announcement] (in Turkish). Turkish Football Federation. 17 April 2012. Retrieved 11 June 2012. ^ "Scotland and Wales consider late joint bid to stage Euro 2020". The Guardian. Guardian Media Group. 14 May 2012. Retrieved 11 June 2012. ^ "Georgia makes solo bid for Euro 2020". AFP. 15 May 2012. Retrieved 11 June 2012. ^ "UEFA EURO 2020 to be held across continent". UEFA.com. Union of European Football Associations. 6 December 2012. Retrieved 24 January 2013. ^ "Wembley to stage UEFA EURO 2020 final". UEFA.com. 19 September 2014. ^ "EURO 2020 to open in Rome, more London games, venues paired". UEFA.com. Union of European Football Associations. 7 December 2017. Retrieved 7 December 2017. ^ Harrold, Michael (27 January 2006). "You won't find a superior trophy". UEFA.com. London: Union of European Football Associations. Retrieved 13 January 2012. ^ "New trophy for UEFA EURO 2008". UEFA.com. Union of European Football Associations. 24 January 2006. Retrieved 13 January 2012. ^ "Regulations of the UEFA European Football Championship 2006/08" (PDF). 2.08: UEFA. p. 3. Retrieved 11 July 2016. ^ "Regulations of the UEFA European Football Championship 2010–12" (PDF). 3.08: UEFA. p. 4. Retrieved 4 July 2012. ^ a b "Regulations of the UEFA European Football Championship 2014–16" (PDF). 4.08: UEFA. p. 11. Retrieved 2 September 2016. ^ "Uefa sets deadline over Euro 2012". BBC Sport. British Broadcasting Corporation. 28 June 2008. Retrieved 13 May 2011. ^ "Uefa to expand Euro Championship". BBC Sport. British Broadcasting Corporation. 26 September 2008. Retrieved 13 May 2011. Wikimedia Commons has media related to UEFA European Championship.